Obi Wan had a flair for the dramatic, but I do know how he feels. Of course, he was referring to the destruction of the planet Alderaan and all of its peaceful inhabitants. My own version doesn’t involve tragic genocide, but I am definitely feeling a gaping hole where there was once life and electric sparkly energy of neon pink and green and blue. Obi Wan describes the force as “an energy field created by all living things … it surrounds and penetrates all living things and binds the galaxy together.” I think some people are more sensitive to this energy than others. I know I feel it when I’m near the ocean and when I’m soaking in the warm golden goodness of the summer sun. I also feel that connection with certain people in my life. The connection to my mom is probably the most obvious. She senses when difficult things are happening for me … sometimes before I’m even fully conscious of the situation myself. When this little blond butterfly flaps her wings in distress on the west coast … my mom always feels it as a hurricane on the east coast. I blame George Lucas. Earlier this week, I felt a connection break that has bound me to someone for the past twelve months. I can tell you exactly when it happened. It was Tuesday morning. I woke and was immediately aware of an absence … a void … something missing. I can’t say what severed this tie. It has been tenuous and faltering for the past several weeks (months if I’m completely honest with myself), but it finally snapped without any obvious cosmic event. I didn’t even have to wonder what had happened. I just knew. An energetic connection that had been there when I fell asleep the night before was gone. I experienced it as a tangible and huge black hole in my universe. I wasn’t particularly sad. Now that I’m not quite so bedazzled by the zingy beguiling prana of this relationship, I see things with a different perspective. It’s a perspective that has a bit less emotion and a bit more logic. I know it will take a while for that space to fill in again, but I plan to fill it with loveliness. Tattoos, messy hair, good abs, and maybe a guitar. A spirit that is equally sweet and surly. A wanderlusting soul and wicked sense of humour. Motorcycles and yoga. A love of sunshine and vampires and oceans and endless music. Ooops … wait!!!! Is this Plenty of Fish? Never mind. 😉 Moving on. And nobody says it like OwK. 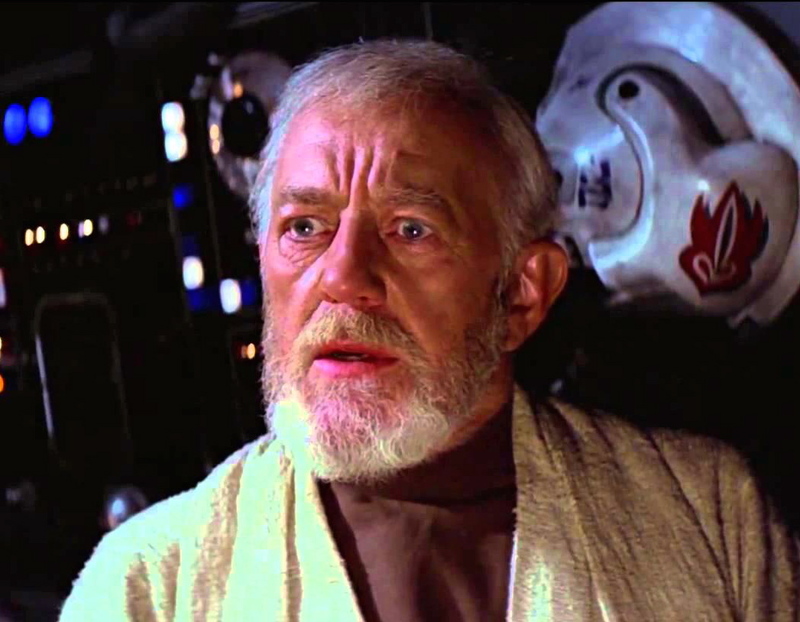 Watch this – I felt a great disturbance in the force.